Go for a pared down but at the same time laid-back and cool ensemble combining a grey vertical striped short sleeve button down shirt and Frame Denim black skinny jeans. Introduce black suede pumps to this look for an extra touch of style. For something on the casual side, consider this pairing of a black coat and Frame Denim Slim Fit Cropped Jeans from farfetch.com. 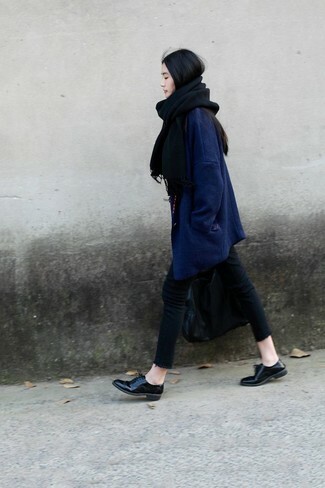 When it comes to shoes, this look is complemented really well with black suede ankle boots. Combining a black tank with Frame Denim black skinny jeans is a nice pick for a laid-back and cool ensemble. If the situation allows casual style, choose a white tank and Frame Denim black skinny jeans. Clueless about how to finish off? Complement this look with a pair of black snake leather loafers to rev up the glam factor. This pairing of a white and red and navy plaid dress shirt and Frame Denim Slim Fit Cropped Jeans from farfetch.com resonates versatility and relaxed style. Now all you need is a nice pair of black leather pumps to round off this outfit. For an on-trend ensemble without the need to sacrifice on comfort, we like this laid-back combo of a hot pink oversized sweater and Frame Denim Slim Fit Cropped Jeans from farfetch.com. Brown leopard leather slip-on sneakers pull the look together. Try pairing a white coat with black skinny jeans to show you've got expert sartorial prowess. Display your sartorial expertise by marrying a navy coat and black skinny jeans for a casual getup. Let your expert styling truly shine by complementing your outfit with black leather oxford shoes. When the setting permits off-duty style, make a camel coat and Frame Denim Slim Fit Cropped Jeans from farfetch.com your outfit choice. Let your sartorial chops truly shine by finishing your outfit with black suede ankle boots.